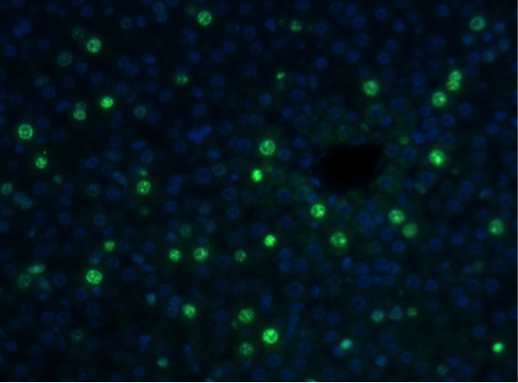 This protocol describes how to immunofluorescence stain for Ki67, a marker of cellular proliferation, in paraffin-embedded tissue sections. This protocol describes how to stain sections of formalin-fixed paraffin-embedded tissue for Ki67, a protein marker of proliferation expressed during S, G2, and M phase of the cell cycle. A primary antibody is used to identify and bind to Ki67, and a secondary antibody conjugated to a fluorescent probe identifies and binds the primary antibody for imaging by fluorescence. This protocol involves use of xylenes. Handle xylenes with appropriate gloves (nitrile, latex, or other gloves rated for use with xylenes). Xylenes should be kept in a chemical safety hood at all times.